Tinibrush® FIVE is a revolutionary high-quality Swiss made dental tool. 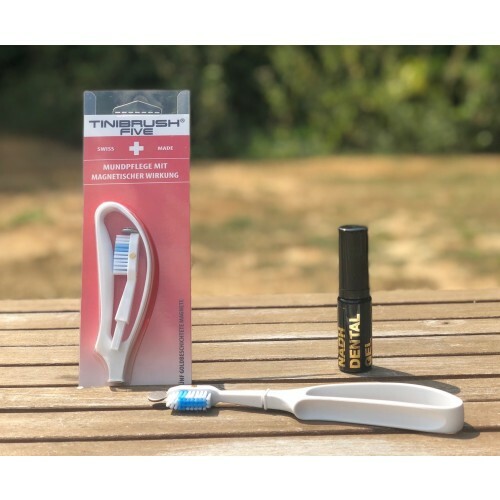 This cutting-edge magnetic toothbrush has been uniquely created with the principals of mouth acupuncture to promote better results in preventing and treating various disturbances in the mouth and throughout the entire body. Tinibrush® FIVE is made of a magnetic toothbrush head with five golden permanent magnets having 1200 Gauss magnetic flow density propagating energy in reflex points of oral acupuncture. These points correlate to the five transformation phases of Traditional Chinese Medicine (TCM). Teeth and reflex points of oral acupuncture have interrelations to organs and the magnets affect teeth and points. Teeth and their environment can cause a breakdown in the five function circles of TCM and inversely, internal organs may have a negative effect on teeth and the mucous membrane. 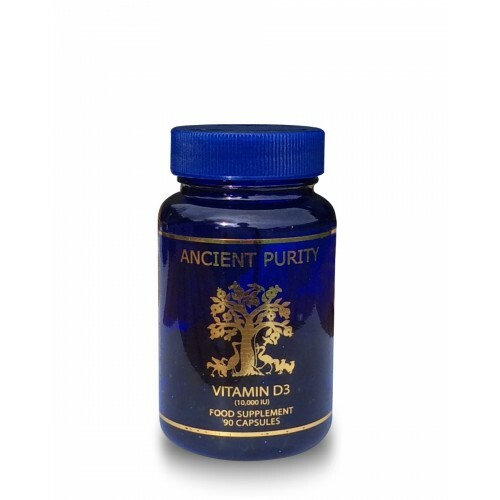 Should this occur, it can lead to multiple types of chronic diseases. For example, inflammation of the mouths mucous membrane often refers to disturbances in the associated function circle of TCM. The magnets used in Tinibrush® FIVE are harmless to the body. The magnets improve blood circulation through a better utilization of oxygen uptake for more efficient transport of nutrients and enhance energy improving due to the elimination of toxins and promoting faster wound healing. 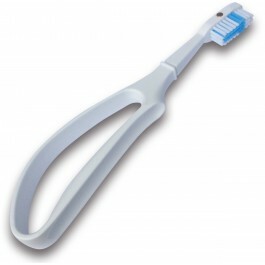 Tinibrush® FIVE can thus aid in correcting functional disturbances and alleviating pain from other areas of the body. Tinibrush® FIVE is impressive with its function and design. Unique is the avant-garde design of the toothbrush grasp allowing the brush to be held at various angles – especially very helpful for people suffering from rheumatic diseases. The grasp also allows an optimal range of reach in the oral cavity for better care and therapy. The toothbrush head can be positioned in 90-180-270-360 degree angles. Use Tinibrush® FIVE after each meal for a minimum of two minutes. The magnets glide over the oral reflex points and their organ correspondences. If a constant feeling of pain should arise locally or otherwise in the body, refer to a dentist or physician expert in biological medicine. This first reaction may aid in detecting health awareness. Brush your teeth with the Tinibrush and with an organic fluoride free toothpaste. 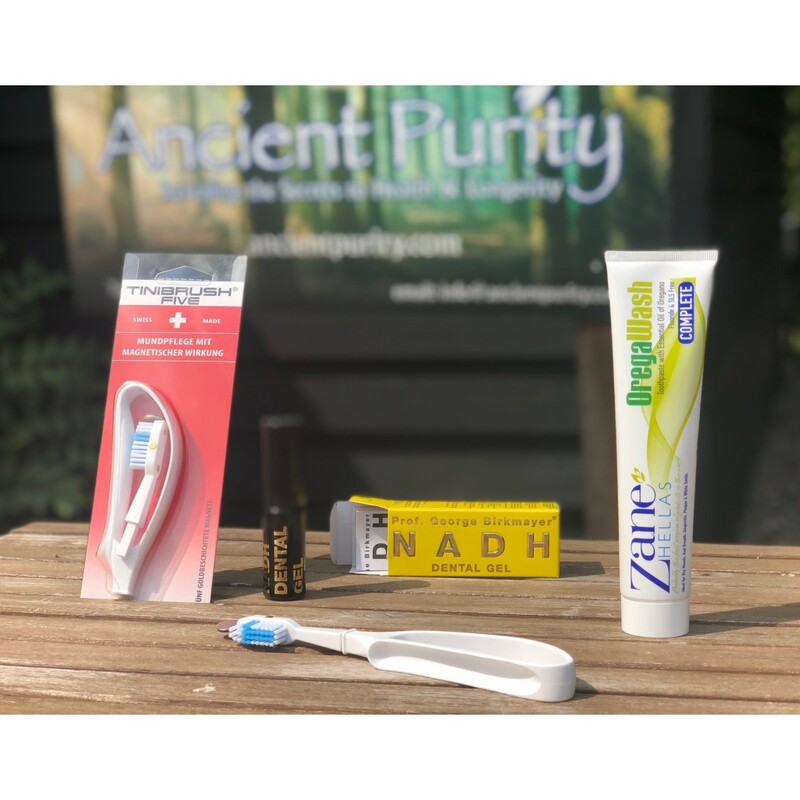 After brushing the teeth spray 1-3 spray shots NADH Dental Gel on to the afflicted area on the gums and rub it into the gum with your finger for 1-2 minutes. 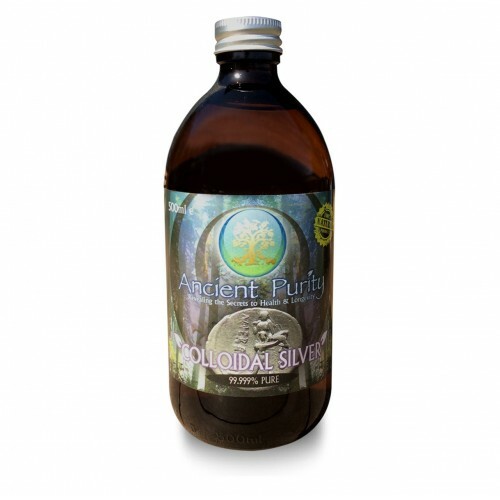 At Ancient Purity, we believe this to be one of the best oral routines there is. Included is a small self-adhesive metal plate as an option to attach Tinibrush® FIVE to any surface. The metal plate's purpose is not to magnetize the magnets and it is NOT to be left on the brush head (danger of swallowing). 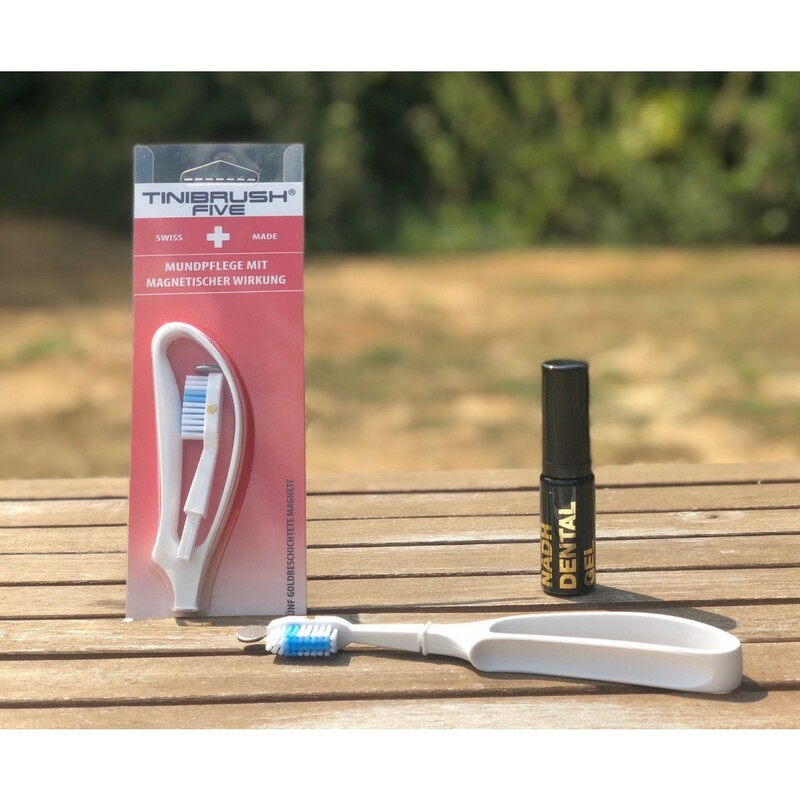 As for all magnetic appliances, people with severe diseases, metal carriers or pregnant women should ask their physician or dentist before using Tinibrush®. The inventor Paolo Tini MD does not take any responsibility. The use of Tinibrush® does not ensure to heal any diseases. Use after each meal for at least 2 mins. Use a healthy natural toothpaste. Brush your teeth with the Tinibrush and natural toothpaste as normal. 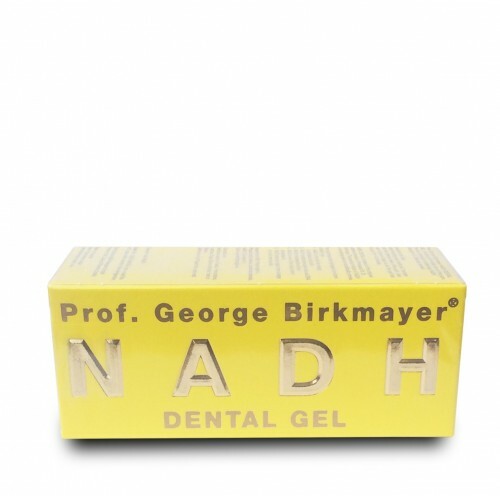 Spray 1-3 spray shots of NADH Dental Gel on to the afflicted area on the gums and rub it into the gum with your finger for 1-2 mins.